For the regular readers; sorry it's been a while in terms of reading something new from me. Who would have guessed that having your first child would mean less free time for creative outlets? Thankfully, Robbe has been holding down the fort with some great articles, and we have some beautiful original shoots coming up to publish throughout the year. Thanks for tuning in wherever you happen to be in the world and especially those sharing posts with friends, it's a real pleasure to have such a large readership these days. Yes, this lovely little thing makes it two Mercedes-Benz in a row to be featured here, but I'm sure you'd agree that our latest features couldn't be less alike. There will be no talk here of luxury, speed records, or in fact any performance figures at all - the Unimog is simply a wonderful little automotive character that deserved a spot on these pages. Strange name, "Unimog". Well, it's actually an acronym of "Universal Motor Gerat" (Gerat being German for machine or device) which goes a long way to explaining the purpose of the vehicle. The Unimog was a range of cars that was simply built to give people a vehicle that could "get things done". Mercedes-Benz started designed the Unimog shortly after World War II, and had it penned to be an all-around agricultural workhorse. Note the fitting for the power take-off or "PTO" on the front of the car. This fitment was essentially a sort of drive shaft (driven by energy directly from the engine) that could be connected to any number of separate machinery for use in the field. This was the key to these cars - they were basically designed to be a self-propelled power source for various tools that were to be used in a variety of locations. Think tools for harvesting crops, saws for clearing out scrub from forest trails, hardware for plowing snow, winches for hauling other drivers out of ditches - you get the idea. This may be an odd analogy but I would liken it to a kitchen mixer, where you attach various different tools to the main drive shaft for different applications. It didn't end there of course, as people imagined all sorts of ways to use these terrific utility vehicles (my Australian upbringing is showing through in the title, apologies if that's a new term for people but that's what "ute" stands for). Around 30 nations have chosen the Unimog for use as part of their armed forces, and countless towns use them in Europe for municipal duty (fire departments, remote maintenance vehicles, and emergency rescue). Not to forget the aforementioned trick of essentially being a portable generator for many other useful machinery in the field. 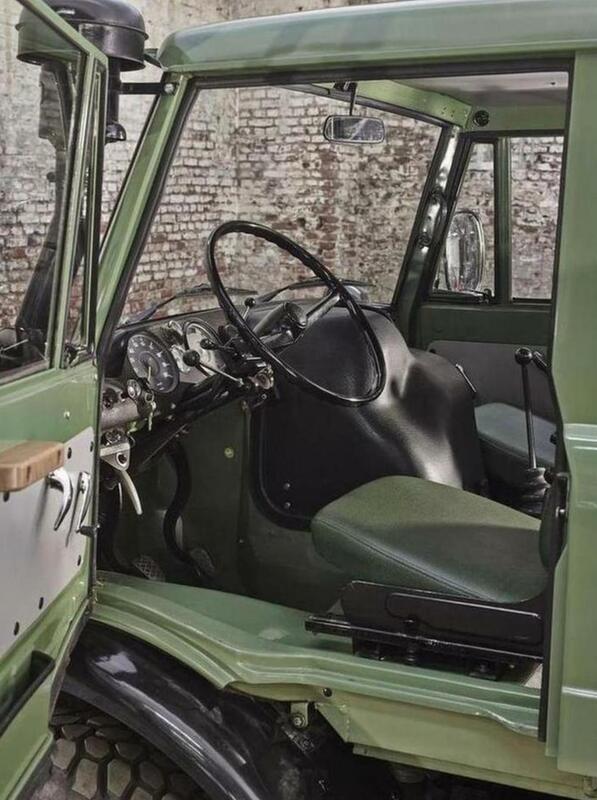 Clearly though, it's not just the PTO that made a Unimog so special (they can be fitted to an array of vastly less capable vehicles), as you look over the album from Bonhams below, it's obvious that this little pup is headed to auction with a few tricks up its sleeve. 4x4 is a given, as are front and rear locking differentials - these cars can go anywhere, as their multiple wins in the Dakar Rally can attest. You may have seen in the head-on shot that the clearance is unusually high, and this is largely due to the use of portal gears that allow the axles and transmission of the car to be higher than the center of the wheels. Clever stuff. Even more unusual though is the fact that the newest Unimogs allow a driver to - I promise you I am not making this up - change the steering wheel and pedals from left to right hand drive, in the field, in under 30 seconds. Now THAT is bloody clever. Don't ask me how they manage that feat, it's largely over my head, but rest assured that it is totally unique. Why would they engineer such a thing? Simply because they are built to get jobs done, and some jobs are going to be much easier to efficiently accomplish from one side of the cabin than the other. What of this particular Unimog then? A rather special little unit, 406 was code for the short wheelbase "Middle Series" (2.38m in the 406 vs 2.9m for the other half of the Middle Series, the 416), and Dopplekabin (just say it aloud) tells you its a crew cab, which didn't leave room for anything but the tiny tray you see at the back there. 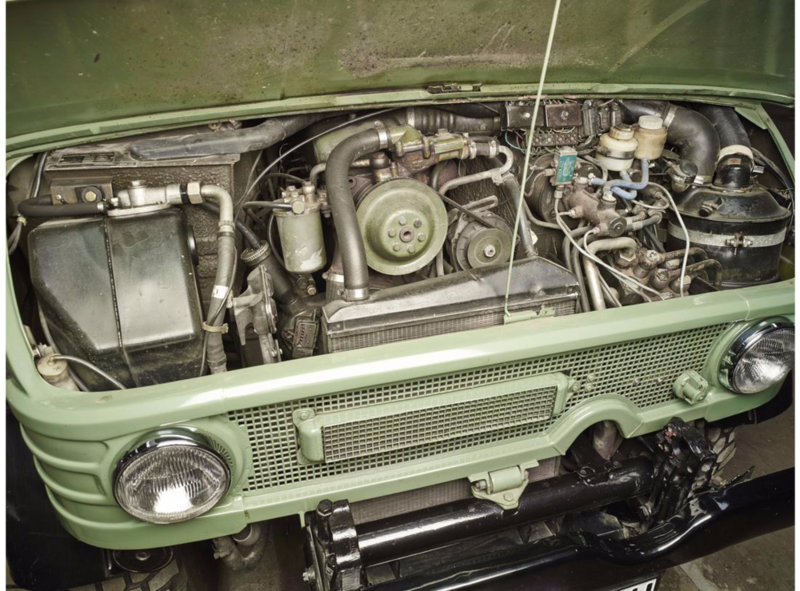 Being a later model year (the Middle Series first being produced from 1963) this example has the direct-injection OM352 Diesel producing 80hp, a tangible step up from the original OM312 and its 65hp. It needed that extra power for its daily duties too; functioning in the Bundeswehr (German Army) on military airports as an aircraft tug. Credit goes to /u/Barcade in the subreddit for finding this 406 Dopplekabin by the way. If you haven't had a chance to join us there yet, then go take a look, because while I curate these pages with cars I personally feel are interesting and worthy of attention, anyone can submit their own favourites there, and (if we have permission to publish them) they will often get featured here, or on our Facebook and Instagram.